I didn’t understand why people got swoony about the combination of peaches and blueberries until I spent a few summers in the Northeast. When those local blueberries came in, along with peaches, they were indeed something to get excited about. Here in New Mexico we might be more inclined (or able, rather) to use raspberries for our local berry. Elsewhere, the blackberry or huckleberry might be your best choice. Either way, the yellow corn-flour dumplings end up surrounded with scarlet or purple juice. The topping is rather moist because I like to drop it by spoonfuls over the fruit to get a cobbled look, like the name "cobbler" suggests. If you prefer to roll out the topping and cut it into diamonds, circles, hearts or other shapes, add another 1/3 cup flour or corn flour to the topping recipe to make a dough that’s rollable and easy to handle. Preheat the oven to 400 degrees. Lightly butter a 2½-quart baking dish. If using peaches, dip them into boiling water for about 5 seconds, then pull off the skins. Slice the fruit, put it all in a bowl, and toss with the sugar, cornstarch, and cinnamon. Let stand while the oven heats and you make the biscuit topping. Mix the flour, corn flour, baking powder, sugar, and salt in a bowl, then cut in the butter using your fingers or two knives. Beat the eggs with the vanilla and buttermilk. Using a fork or your fingertips, lightly stir it into the flour mixture until it is evenly mixed. It will be rather wet. 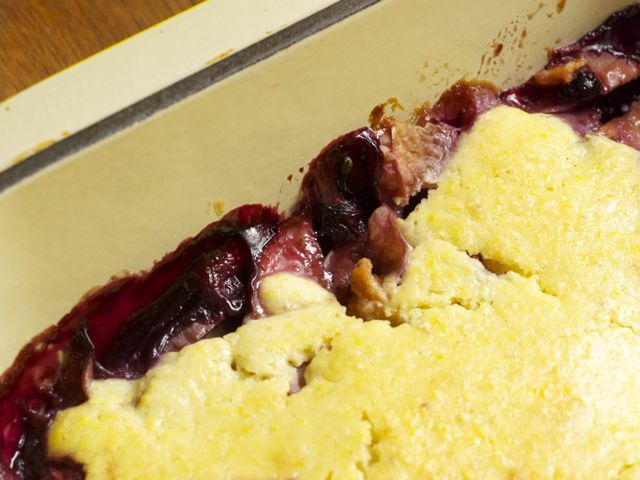 Transfer the fruit to the baking dish, then drop the cobbler batter by small spoonfuls over the top, covering the entire surface. Bake in the center of the oven until the topping is golden brown and the juices are bubbling around the edge, about 25 minutes. Let cool and settle for at least 20 minutes before serving, with whipped cream or ice cream if you like. Corn flour is available from Bob’s Red Mill. I prefer it to polenta, which I feel is too coarse and hard here; a finely ground cornmeal is also acceptable. Read more about summer fruit in Deborah Madison's "The fruit sublime."